> CONDITION: Piece has been carefully protected on a large roll. It is smooth, clean and in excellent condition. Silk is vibrant in color with no stains, rips or damage. The reverse sheer backing has a few minor age-related separations at the edges, with some small stabilizing hand stitches. Braided fringe is in excellent condition, absolutely beautiful. 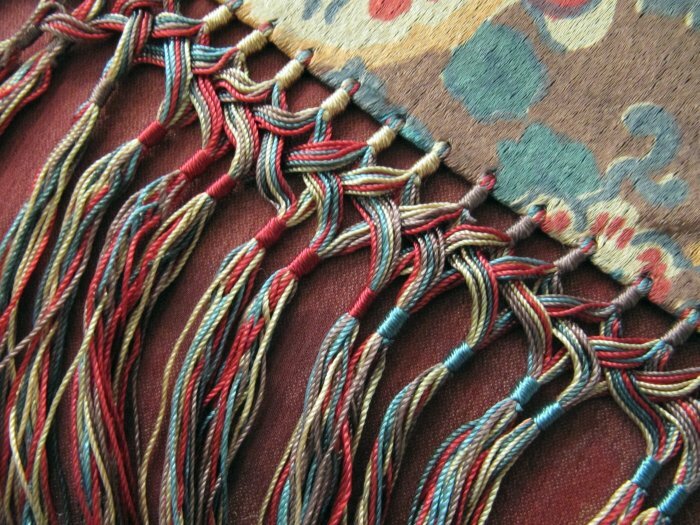 Tassels are in excellent condition, but were stored in a small plastic bag such that the bottom fringe strands have curled.